Spring not only heralds longer days and warmer weather. It also signals the onslaught of yellow dust. When the dust rolls in, the masks go on and pork, which is believed to help detoxify the body of inhaled pollutants, gets served. Add to that the recent, controversial public reaction to the news of yet another case of mad cow disease in the U.S. and it looks like this might be the season of the pig. Now, when it comes to breds on South Korean turf, the Jeju Island black pig is among the most prized. It is the veritable wagyu of “porkdom.” It is the poster boy of rarity, partly because it is harder to get (news reports estimate that for around every six average pigs only one black pig goes to the slaughterhouse annually, and that is for Jeju Island alone). That also means it is more expensive. 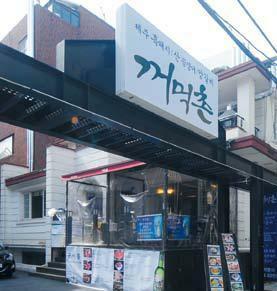 Famed Jeju black pork restaurant Heukdonga CEO Lim Jong-hoon puts the price tag at around 20 percent more than that for the average pork. So why are people forking over money for this dark-haired animal with perky ears? “The Jeju black pig has a high proportion of red muscle fibers,” Kim Ho-su of GilGal Livestock Company, which raises and distributes Jeju black pigs and its pork, said. Put in layman’s terms, that translates to redder meat. It is also believed by some that those red muscle fibers may serve as an indication that the meat will boast a rich, strong steak-like taste, i.e. like beef, which has them in spades. “Some consumers say Jeju black pork tastes nutty, and therefore requires no extra seasoning,” GilGal department head Kim, 47, added. In fact, Shin, 48, repeatedly stressed the chewiness of the pork, especially if it has been aged properly. Elasticity is a tough quality to understand as appealing in meat ― that is until you have taken a thick slab of Ggeokmeokchon’s Jeju black ogyeopsal (five-layered pork belly), laid it over a hardwood charcoal grill, let the flames lick it, cut it up and started to pop crisp, piping hot morsel after morsel into your mouth. Now that these industry insiders have given us their take on Jeju black pork, identifying it might seem like a piece of cake. However, a recent controversy regarding the authenticity of black pork sold in restaurants highlights how challenging it can be to know if what you are eating is the real deal. In late January, an MBC television program had genetic tests conducted on 38 cuts of pork from 24 black pork establishments and found that 10 cuts from nine eateries were not black pork. How, then, can one tell if it is a black pig? The program and the ensuing press over it not only pinpointed certain difficulties in telling whether or not pork is from a black pig, it also testifies to the obsession we have over black pork. Of course, when it comes to black pigs, the Jeju black pig, in particular, has serious name value. That doesn’t mean everyone is a fan. 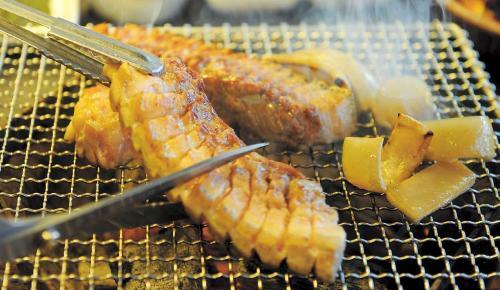 The best way to decide if you like Jeju black pork is to try it. ● Ggeomeokchon: 95-8 Nonhyeon-dong, Gangnam-gu, Seoul; (02) 544-6951; open from 11 a.m. to midnight weekdays, till 10 p.m. on weekends; one order of Jeju native black ogyeopsal (five-layered pork belly) costs 15,000 won with an initial two order minimum. ● Heukdonga Samsung Outlet: 147-15 1, 2F Samseong-dong, Gangnam-gu, Seoul; (02) 2051-0008; www.blackpigseoul.co.kr; open 11 a.m. to 5 a.m. Monday through Saturdays and till 10 p.m. Sundays; grilled pork costs 16,000 won per order with a two order minimum.